WorkNC is the closest system to “One Button CAM” with automated, efficient toolpaths bringing dramatic productivity gains through shorter machining times, longer tool life, improved surface finish and accuracy, better machine utilization, and fast and easy CNC programming. 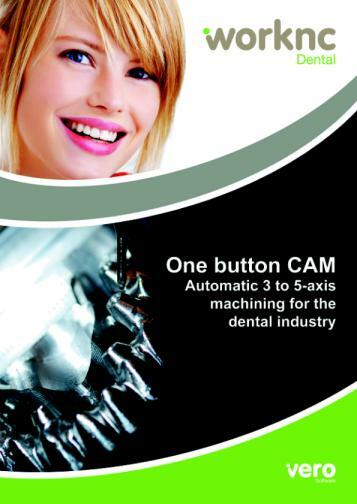 WorkNC Dental is the automatic solution for machining dental prostheses, implants and structures in the shortest possible time. 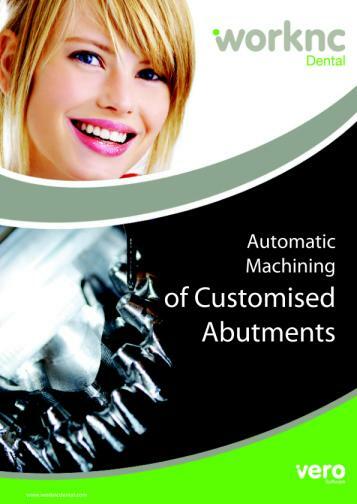 Its perfectly optimized machining sequences apply state-of-the-art 3 and 5-axis technologies tried and tested by thousands of users in highly demanding industries. WorkNC Dental uses advanced algorithms for all automatic recognition functions from hole recognition to automatic placement. All these functions are associated with powerful interactive tools for manual and accurate positioning. WorkPLAN is a fully-scalable family of manufacturing software solutions, for project management to full ERP, which enables custom manufacturers, project-based and make-to-order companies and job shops to manage their business efficiently. WorkXPlore is the ideal tool for directly displaying and analyzing 3D CAD files without the need for the original CAD applications. This easy to use software enables novice and experienced users alike to explore any type of standard or native 2D/3D CAD file. WorkNC Designer fills the gap between CAD and CAM. From fixture design, to part repair & modification, WorkNC Designer is the ultimate CAD solution for taking geometry through to manufacture.